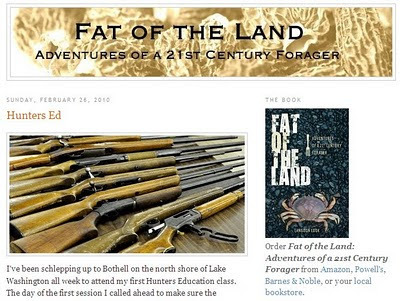 Fat of the Land needs no recommendation from me, surely? It's one of a few 'real food' blog that stand in a class of their own. Recently, with his always-thoughtful writing and beautiful food photography, Langdon has been documenting his first steps into the world of small-game hunting. For us Hunter-Bloggers, this is very good news indeed. Is it lazy of me to recycle comments that I've written on other people's blogs as posts on my own? Well, yes, I think it is. I'd say that there are positive dangers to feeling 'comfortable' around guns. 'Comfortable' is what you might reasonably expect to feel after a good meal with friends and a bottle of wine; the same state of mind in the field, however, might well get you or your friend seriously hurt or killed outright. So I think it's perfectly fine to be wide awake and a little nervous around any sort of firearm. Hunters - I'd dare to say, based on my very slight experience - are people who hunt, not people who have a certain set of feelings about the tools that come with the discipline. Gun fetishists certainly do exist, though - as certainly as does a certain sensibility (among non-hunters by and large) that takes the words 'hunter' and 'gun-fetishist' to be two terms for the same thing. There may well be hunters who are gun fetishists but there's no reason to think that to use a particular tool is to by necessity make it an object of misguided worship. We do use the same word - 'killing' - to refer to what we do when we deprive one of our fellow humans of their life and also for what we do when we take the life of an animal for the table: we kill them. But it's a mistake, I'd say, to imagine that because we use the same word we are therefore performing acts with the same grave ethical weight. To make this mistake and equate the taking of an animal life for food with the taking of a human life does damage I'd argue mainly to the infinite respect we owe to human life. We do a serious thing when we take the life of an animal for food, it's true; but (with the exception of those thankfully rare situations where a failure to act in this terrible way may do greater harm to others) we do an evil thing when we take the life of one of our fellow humans. If we can't distinguish between 'serious' and 'evil' then, I'd say, it's our fellow humans that we stand to harm the most. Thanks for your good writing and the best of luck to you with the hunting. Thanks for bringing yet another fine blog to my attention! IMHO it is not evil to kill another human being, although I do believe it is evil to murder another human being. I agree about the level of comfort when handling a firearm. I like my flintlock fusil very much, would not want to be without it. But I have seen the damage a big gun can do close up, and I am always aware of the damage that my guns can do. One time during winter I was hunting in a new area, there was deep snow all about. I slipped into a crevice that was hidden by the snow, I was chest deep and when I looked down there was the muzzle of my rifle staring at me!!! One should never get complacent about the dangers that exist when using a firearm, you need your wits about you. Hey Hubert Hubert, I appreciate your thoughtful comments on my blog--and it's reassuring to know there's an entire community supporting my journey into this new realm. Thanks for joining the trip! It's a pleasure. Albert; you've done the same for me many a time after all. AKA Angrywhiteman: Well, O.K, your comment is very welcome and I think we'll have have to agree to differ on this one. I'd say that killing another human is always an evil but that isn't to say that circumstances may not arise in which we are compelled to commit this offence by necessity so as to avoid a greater evil. In this case then I suppose it it might be judged to be a 'necessary evil'. Le loup: Quite! Without our wits about us we may end up with our brains about us. Langdon: Thank you. It's a pleasure to welcome you to the community of the hunter-bloggers! I like this particular article it gives me an additional input in the information a round the world. Thanks a lot and keep going with posting such information.